The O bag is the infinitely versatile and eponymous product of the O bag brand. Customisable Italian handbags, shoulder bags and beach bags available in a multitude of colours, combinations and styles; you’ll never see two exactly the same. The bodies are made of a lightweight foam called XL Extralight®, which is soft and warm to touch, waterproof, strong, flexible and anti-microbial. You can never have too much choice when it comes to the O bag; available in a wide range of shades, some of which are seasonal limited edition inspired by key colours seen on the catwalks. 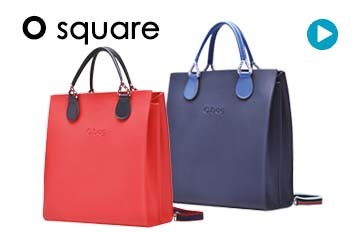 O bags offer the unique ability to create and customise your own handbag; picking and choosing your preferred colours, handles, trims and inserts to suit any occasion, outfit or taste. There’s a wide range of interchangeable O bag handles and shoulder straps to choose from in many colours, lengths and materials; genuine leather, faux leather, rope, vinyl and suede. You can accessorise your O bag handbag with zipped inserts in cotton canvas, felt and wool for a nice stylistic touch and additional functionality whilst also keeping your belongings that little bit safer. New and interesting O bag designs and accessories are launched every year to buy online with global delivery to 60 countries. See our PRODUCT GUIDE for O bag Dimensions and Fitting Instructions. SUBSCRIBE to our eNEWSLETTERS to hear about NEW products and launches.